There was a rally attended by CWA members and coalition partners, including Good Jobs Nation, Our Revolution, the AFL-CIO and others, at AT&T Indiana Headquarters and Monument Circle in downtown Indianapolis. 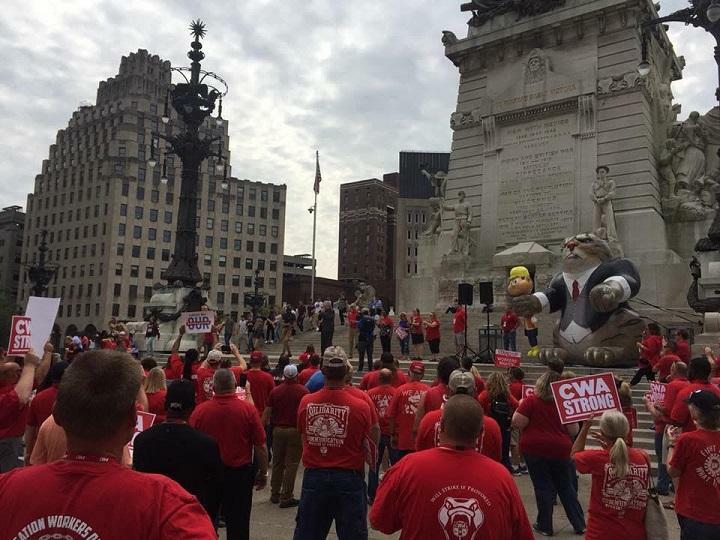 There were a number of speakers; including CWA President Chris Shelton, CWA District 4 Vice-President Linda Hinton, CWA Telecommunications and Technologies Vice President Lisa Bolton, Indiana State Representative Karlee Macer and others. The speakers and all those in attendance called on AT&T to end their destructive and despicable behavior of offshoring and outsourcing the jobs and work of their long time employees, leaving a wave of devastated families and communities in the aftermath of their poor decisions. At the District 4 meeting all leaders committed to continued mobilization to hold AT&T accountable in the public realm by continuing to gather political and community support in our fight for a just contract. Please reach out to your local mobilization coordinator to see how you can continue to be a part of these efforts. Spread the message that AT&T’s offshoring and outsourcing hurts workers, damages communities and puts customer service and information at risk!